Well this time it's my all time favourite heroine's movie Breakfast at Tiffany's. This is one of my favourite movie as well. In this movie Audrey Hepburn plays a beautiful young socialite in New York who has a cat with no name. 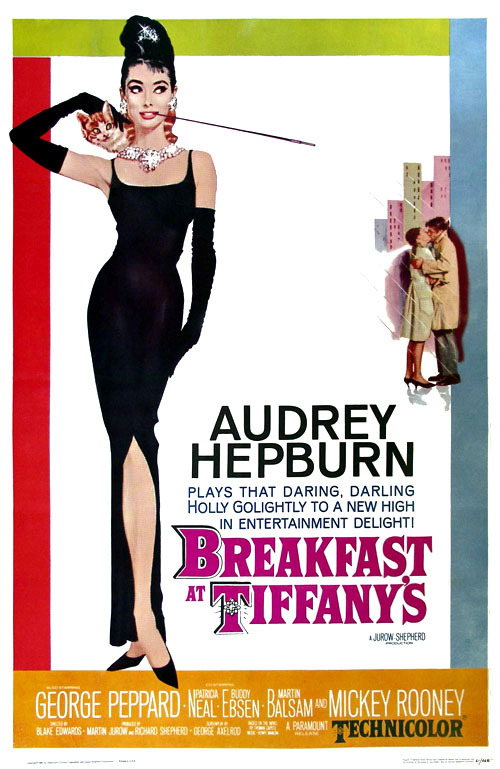 This movie won the best song Oscar for the song Moon River performed by Audrey Hepburn herself and music by Henry Mancini and Lyrics by Johnny Mercer. It also won an Oscar for Henry Mancini's background score. I have seen this movie more than ten times and yet I'm unable to keep myself staring at the sweet, naughty & charming beauty of Holly Golightly. I recently bought a poster of Audrey Hepburn. The poster is a photo from from this movie where she is sitting in a restaurant smoking with a huge a cigarette holder wearing a black dress, which is an iconic picture.